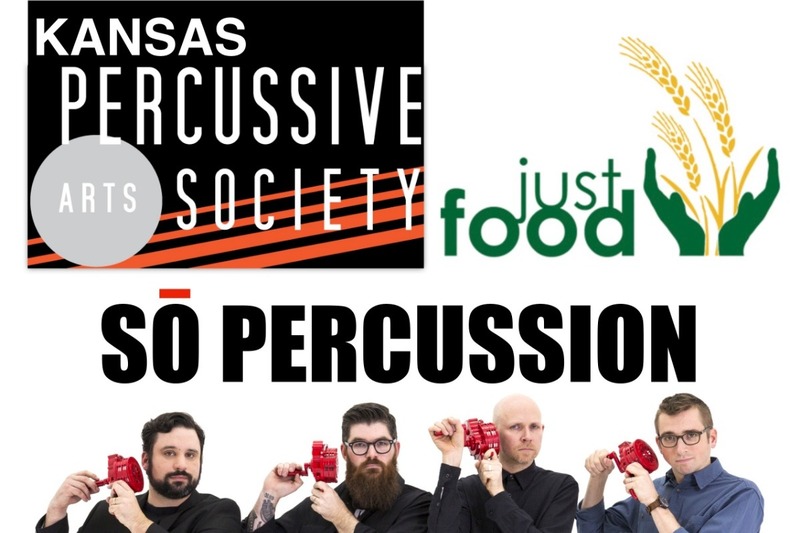 The Kansas Percussive Arts Society (KPAS) is raising funds for a dual purpose, operating funds for the 2019 Kansas Day of Percussion (KDOP) and fighting food insecurity in Kansas. The KDOP will be held Saturday March 23, at the University of Kansas, and will feature the Brooklyn based Sō Percussion. Also featured will be local performers and Kansas high school and collegiate percussion groups. Inspired by Sō Percussion’s work with End Hunger North East, KPAS has chosen Just Food KS, a Lawrence, KS based food bank, as a community partner and recipient of a portion of the proceeds raised. The Kansas Day of Percussion is an annual event sponsored by KPAS with the goal to inspire, educate, and support percussionists in Kansas. The featured artists, Sō Percussion have been said to “play with irresistible vitality” (Washington Post) and have “helped to ignite an explosive new enthusiasm for percussion music old and new” (The New York Times). They hold the title of The Edward T. Cone Ensemble-in-Residence at Princeton University as well as leading the Sō Percussion Summer Institute. At the KDOP, Sō will be coaching 16 high school and collegiate ensembles, presenting a clinic, and performing their work Amid the Noise. Sō Percussion will be joined on stage by 20 Kansas high school and collegiate percussionists to perform their musical experience Amid the Noise. Please support this event by going to www.gofundme.com/ks-day-of-percussion-and-just-foods. If you would rather send a check or are part of an organization interested in supporting KPAS please contact KPAS president Dr. Von Hansen at paskansas@gmail.com. The Kansas Percussive Arts Society is a chapter of the Percussive Arts Society, Inc an international, educational non-profit (501c3) organization dedicated to inspiring, educating, and supporting percussionists and drummers throughout the world. The Kansas Day of Percussion is supported by a Visiting Artist Grant from The Kansas Creative Arts Industries Commission.